Atheneum Books for Young Readers, 9781481435260, 368pp. 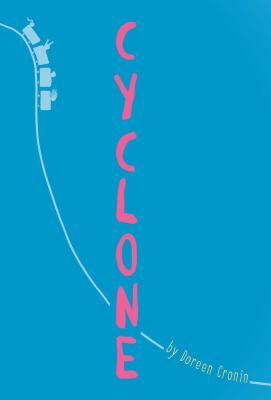 Riding the Cyclone, the world famous Coney Island rollercoaster, was supposed to be the highlight of Nora’s summer. But right after they disembark, Nora’s cousin Riley falls to the ground…and doesn’t get up. Nora had begged and dragged Riley onto the ride, and no matter what the doctors say, that she had a heart condition, that it could have happened at any time, Nora knows it was her fault. Then, as Riley comes out of her coma, she’s not really Riley at all. The cousin who used to be loud and funny and unafraid now can’t talk, let alone go to the bathroom by herself. Now she’s only 10% Riley. Nora, guilt eating her up on the inside worse than a Coney Island hotdog, thinks she knows how to help. How to get 100% Riley back. But what Nora doesn’t realize is that the guilt will only get worse as that percentage rises. Doreen Cronin is the author of The Chicken Squad series, Cyclone, and many other New York Times bestselling picture books, including Click, Clack, Surprise! ; Click, Clack, Ho, Ho, Ho; Click, Clack, Peep; Click, Clack, Boo! ; Dooby Dooby Moo; Thump, Quack, Moo: A Whacky Adventure; Bounce; Wiggle; Duck for President; Giggle, Giggle, Quack; Bloom; and the Caldecott Honor Book Click, Clack, Moo: Cows That Type. She lives in Brooklyn, New York. Visit her at DoreenCronin.com.